After some time off I have taken up blogging again. 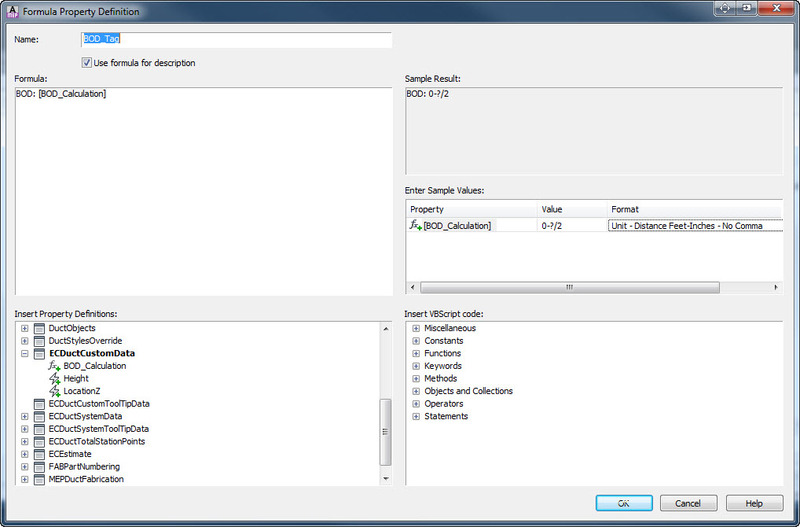 This is a first post on creating custom content catalogs in AutoCAD MEP. My thoughts are to expand this topic a little bit to include modifying the catalogs and moving content between them and then finally a large series of posts on creating all kinds of custom content. Additionally, I hope to upload new downloadable content that includes all kinds of manufacturer specific content as well as plugins that will enhance the AutoCAD MEP experience. Enjoy! Recently a question was asked on the AutoCAD MEP forums about how to put the elevation of a Mass Element in a property set definition when neither the location or the elevation was available as an automatic property. You can view the original post here. Since this was very similar to a post that was covered previously on this blog it was an easy solution. First I created a new property set definition that referenced a mass element and then added the automatic property definition OBJECTID. Once that was complete I created a new formula definition and added the following code. Make sure to replace the [OBJECTID] in the code below with a reference to the automatic property! 'MEP 2010 = "18.0s (LMS Tech)"
'MEP 2011 = "18.1s (LMS Tech)"
'MEP 2012 = "18.2s (LMS Tech)"
'MEP 2013 = "19.0s (LMS Tech)"
'MEP 2014 = "19.1s (LMS Tech)"
'MEP 2015 = "20.0s (LMS Tech)"
There are two types of parts in an Autocad MEP MvPart Catalog. A block based MvPart and a Parametric MvPart. Block based parts are created from 3D solids or Mass Elements. Additional sizes that are added to the part are done by creating a new block and adding it to the catalog drawing file. Parametric parts are created using dimensions and constraints. All sizes are modeled from a single part that is ‘flexed’ by its parameters to create a almost unlimited amount of size combinations. 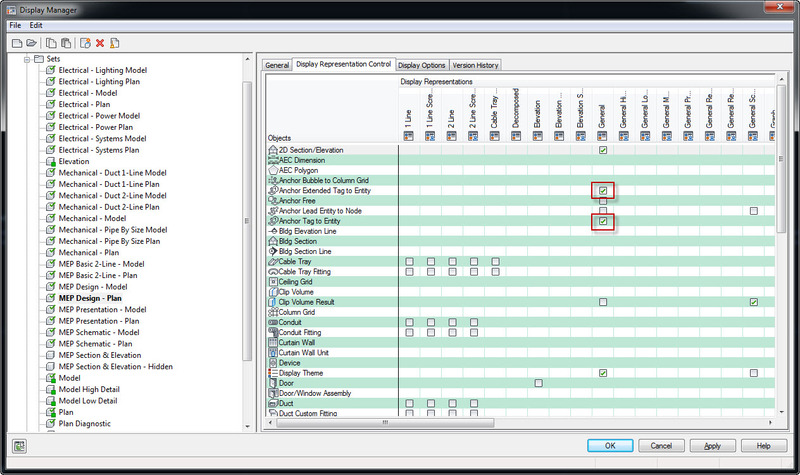 Even though each part type is created using content builder, the interface to do so is decidedly different for a block based part than that for a parametric part. The main advantage of a parametric based part is that it is quite easy to create new custom sizes as long as the model is built correctly. 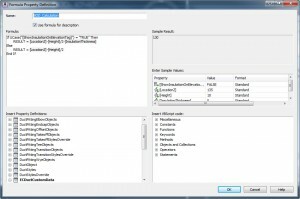 How do you tell when adding a part if it is parametric or block based? 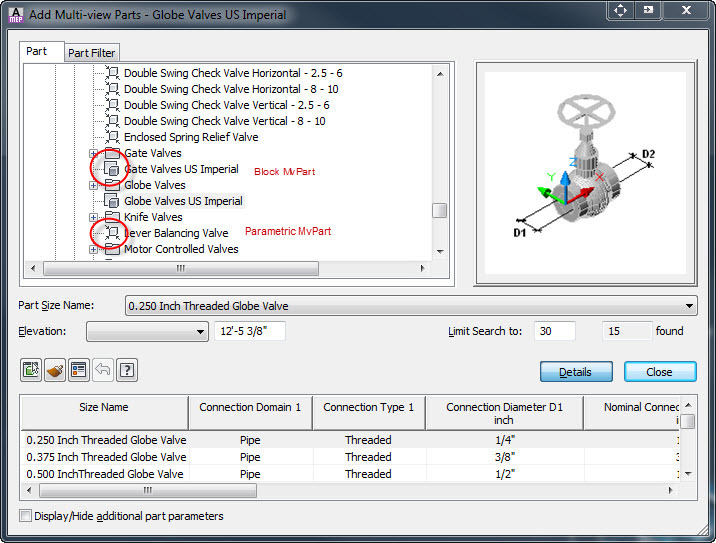 It is quite easy by looking at the icon of the part in the Add Multi-View Parts Dialog. The picture below is worth a thousand words. In the last post we looked at how to add an undocumented property to a property set definition. 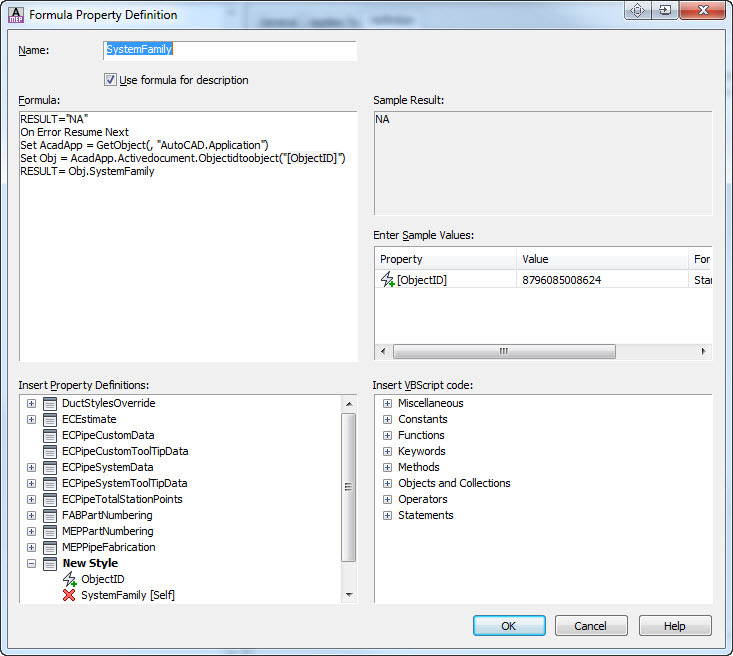 This time lets try to add a formula based location property to a space object using the method from the last post. When this property definition is created and made visible there is no information being reported. The property definition is blank. Why is this? This is because a location property is actually made up of three different values (x,y, and z) that are stored as a point object in the system. VBScript does not know how to read point objects so the point object will first need to be converted into an array before it can read. The following code gets the space location and breaks the location point up into its 3 separate values and then concatenates them together as a string so we can read them and returns the result. 'ACA 2010 = "18.0s (LMS Tech)"
'ACA 2011 = "18.1s (LMS Tech)"
'ACA 2012 = "18.2s (LMS Tech)"
'ACA 2013 = "19.0s (LMS Tech)"
'ACA 2014 = "19.1s (LMS Tech)"
'ACA 2015 = "20.0s (LMS Tech)"
The value of the property definition should look something like this 144.124;1200.375;0. This would place the space object 12′-0 1/8″ on the positive X axis, 100′- 0 3/8″ on the Y axis and at a zero elevation. If you would like to see more or less decimal places in the result then you can change the second line of code from DecimalPlaces = 3 to DecimalPlaces = X where X is the amount of decimal places you would like to see. And finally if you are only interested in the elevation of the space then you can modify the result of the script to instead say RESULT = LocationZ. There is no need to convert to a string in this case as a number would be more preferable as the units of the property definition could then be set to a length value and read as feet and inches. In our last post we looked at creating the calculations necessary to create a bottom of duct (BOD) elevation tag. In this post we are going to create the actual tag. 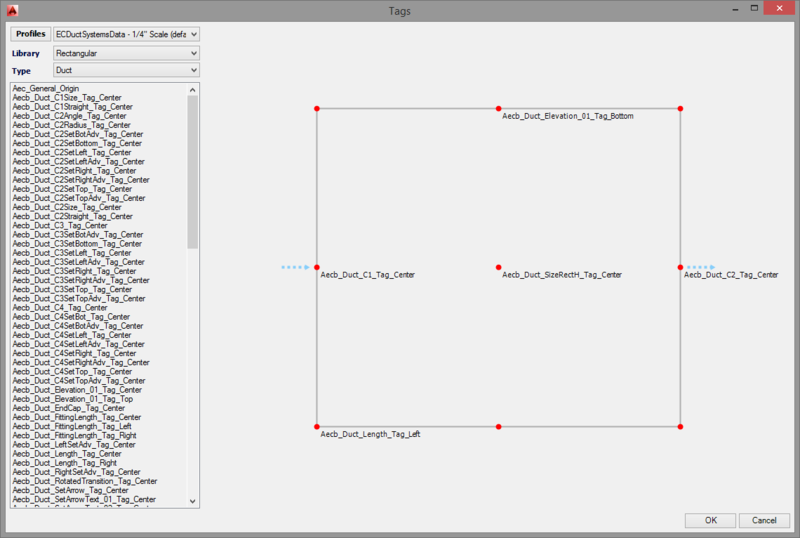 We will create multiple versions of the tag that has a middle-left insertion point, middle-center insertion point, and a version with a middle-right insertion point. So lets get started. The first thing that we need to do is create an mtext item to start our tag with. In order for the tag to display correctly with annotation scaling we need to create the text at 1″ tall and with annotation scaling turned OFF. This will insure that the tag will display correctly at all annotation scales. The tag itself will control the annotation scaling process so creating the text with annotation turn on will only compound the scaling. This is something that we do not want. Once we have added an mtext item we need to duplicate it for a total of 3 items and then set the justification for each of the three mtext items. One each for Middle-Left, Middle-Center, and Middle-Right. Select the text with the Middle-Left justification and start the DEFINETAG command. 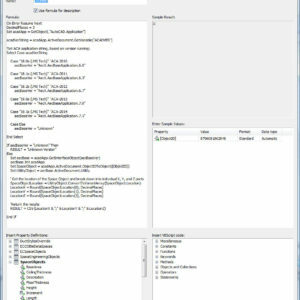 This will bring up the Define Schedule Tag dialog box. Lets name our tag Aecb_Duct_BOD_Tag_Left. I like to create a naming scheme that is easy to follow. Looking at the tag we can see that it is a building systems tag for duct that defines the bottom of duct elevation and its insertion point is Left. A good naming scheme will allow you to select the correct tag using the property palette without referring to any additional documentation. Now that we have the Define Schedule Tag dialog up and named correctly we can create the tag. 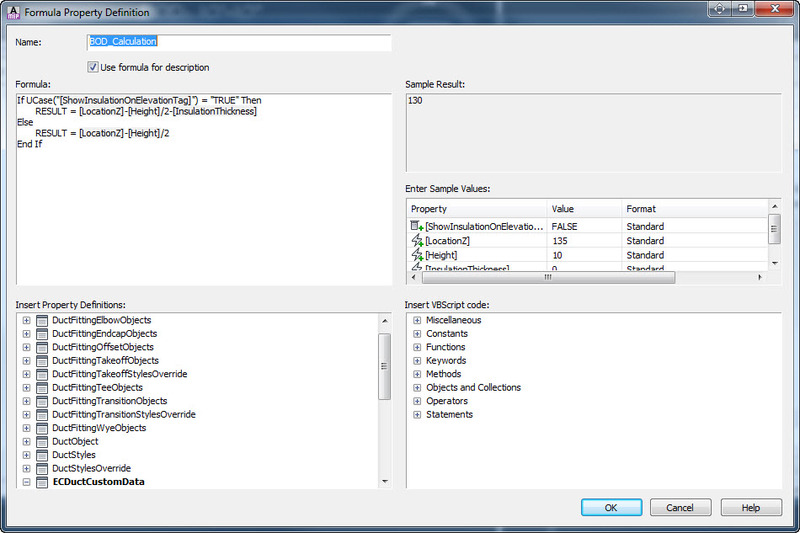 To do this select the Text in the Type column and change it to Property. This will allow our tag to read from a property definition instead of reading a static piece of text. 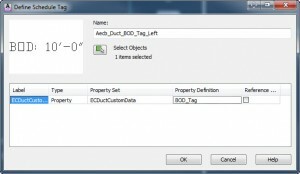 Change the Property Set to ECDuctCustomData and choose the Property Definition to be BOD_Tag and then hit OK. We should now define the insertion point of the tag by selecting the insertion point of the text. Lets rinse and repeat for the Center tag and the Right tag making sure to change the name to reflect the justification of the tag. In the next part of the series we will look at adding an option to show the bottom of insulation. So now that we have a couple of criteria in place we can get started creating the tag. To find the BOD a couple of pieces of information about the duct will be required. In property set terms this information is called automatic properties and for duct the Z elevation is considered an automatic property. In other words, this property is supplied by the program automatically to any property set that wishes to use it. Unfortunately the elevation supplied is not the bottom of duct, it is instead the centerline elevation of the duct. So we will need to know the height of the duct to calculate the BOD elevation. Fortunately the height of a piece of duct is considered an automatic property and returns the depth of a rectangular piece, the minor of an oval piece, or the diameter of a round piece of duct. So now that we have our two automatic properties we can get started creating our tag but first we need to decide in which property set to calculate our new BOD elevation tag. The ductobject property set supplied by Autodesk already contains our two automatic properties so we could just create the tag there but we want our property set to automatically be attached to each piece of duct and any property sets supplied by Autodesk out of the box do not have this functionality. We could use the ECDuctSystemData which is attached automatically when the DUCTSCHEDULEDATA command is ran or when the duct is set to be automatically broken into sections and tagged but this would not be a good idea. 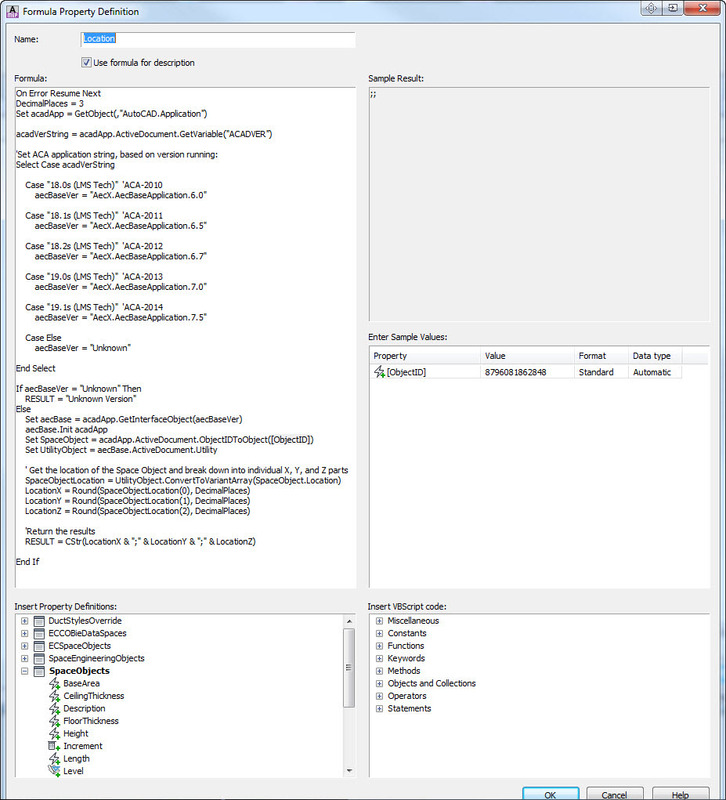 Any information in this property set can be changed or removed from release to release. Instead we will place our information inside of the ECDuctCustomData property set which acts exactly like ECDuctSystemData but will never be modified by EastCoast. This means that when the next release comes out we can be 100% confident that our property set will still work as intended. Since ECDuctCustomData is shipped completely empty we will need to add the automatic properties to it and once we do that we can get started creating our tag. 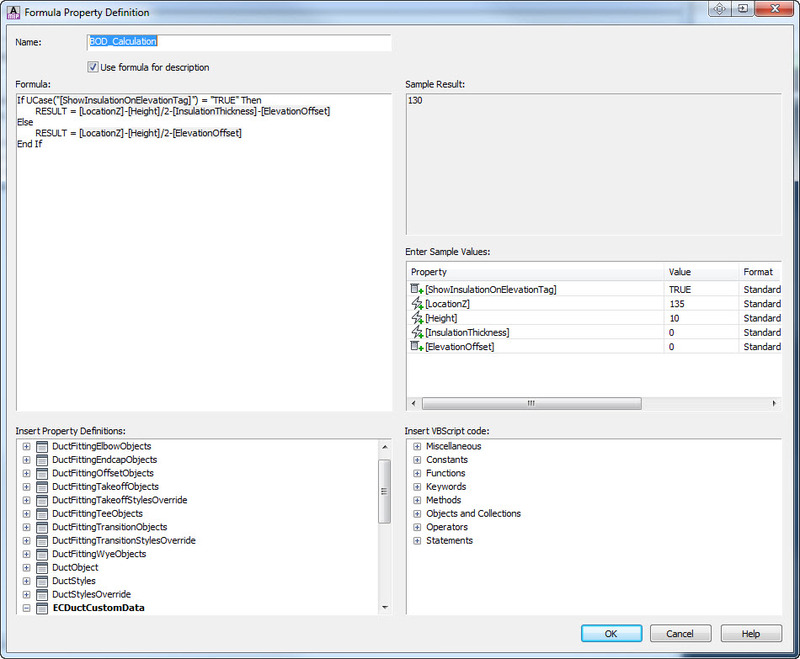 To add the automatic properties to ECDuctCustomData we need to start the stylemanager and navigate to the property set section. A shortcut for to get to this section is to just type the command PROPERTYSETDEFINE at the command line. 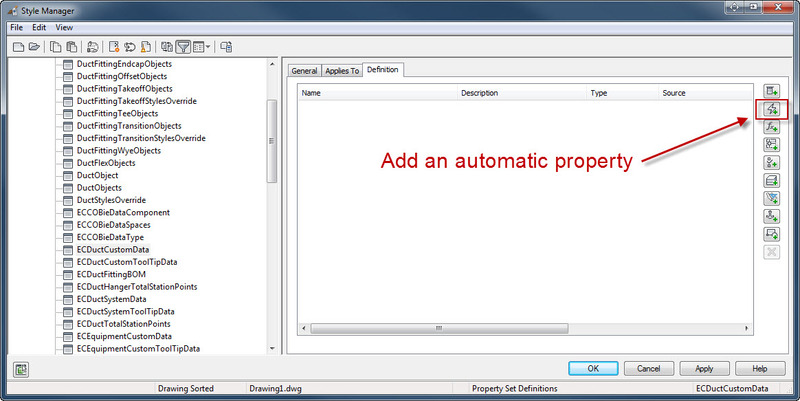 This will bring up the property set manager as shown below where we can add our two automatic properties. Since this is the first time we have added anything to ECDuctCustomData it will be empty. 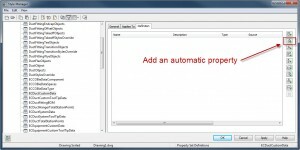 To add an automatic property we just need to select the automatic property button as shown in the picture to the right. This will bring up a dialog where we can select LocationZ. 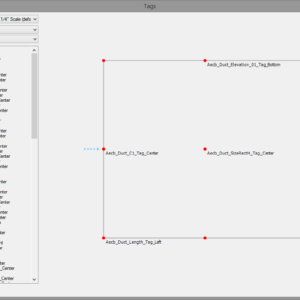 We then need to create another automatic property and select Height. Once we have these two automatic properties created we can start to create our formula to calculate the BOD elevation. 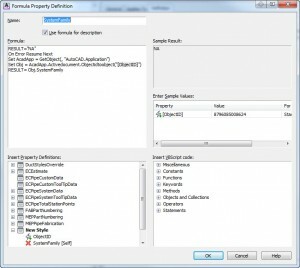 To do this we will need to create a formula property definition. The button for this can be found immediately below the automatic property button. This will bring up a dialog similar to the one shown below. As shown in the picture I named the formula BOD_Calculation and I have already entered in the formula to calculate the bottom of duct elevation. ([LocationZ] – [Height]/2). 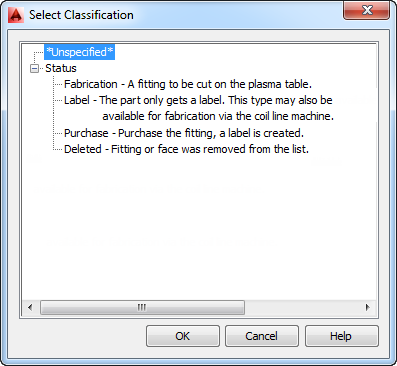 Anywhere you see an item enclosed in brackets you should not type in the value but instead choose it from the list in the Insert Property Definitions: section. 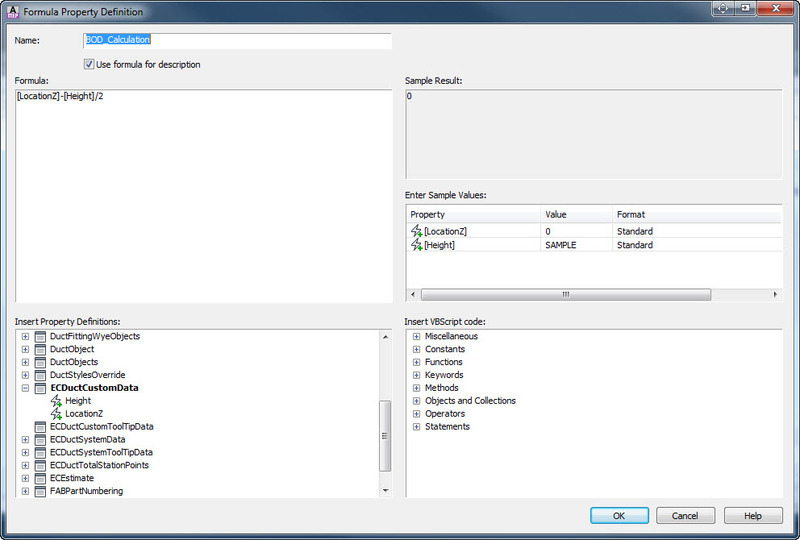 In the Enter Sample Values: section make sure that the format is set to standard for each entry. Why did we set the format to standard? We really want the elevation to display in an architectural format so why didnt we set it here? Well the answer is that this is not the property that we are going to read with our tag. This property is just being used to calculate our elevation. We will format the elevation correctly in our next property which we will call BOD_Tag. This should also be a formula property set and in this case we will name it BOD_Tag. 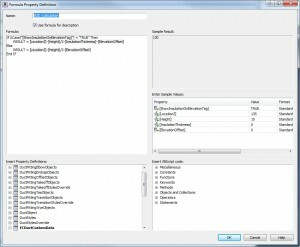 Enter in the formula “BOD: [BOD_Calculation]” this time typing in “BOD: ” and then selecting BOD_Calculation from the list under ECDuctCustomData. Make sure to set the format correctly this time to Unit-Distance Feet Inches – No Comma. 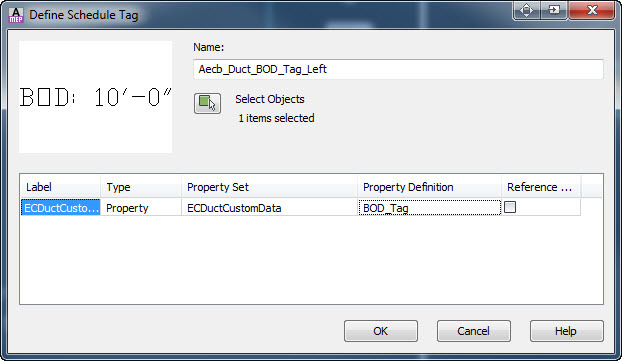 One last thing to do today is to look at all of the properties of ECDuctCustomData and turn off the visibility of all property definitions except for BOD_Tag. This will insure that the only property definition that will show on the property palette will be just the one we are interested in. Below is a video of the entire process. In Part Two we will show how to create the actual tag itself and save it in the correct style drawing.